A man facing execution in two weeks appeals to Sherlock Holmes to save him from the gallows. He claims that he is innocent and Holmes agrees to take on his case. Five years earlier he was convicted of the largest theft of art masterpieces in British history, and of murdering the butler who tried to stop him. With time running out, Holmes and Watson have to find the real murderer and the missing works of art —this is, if the client is innocent after all. 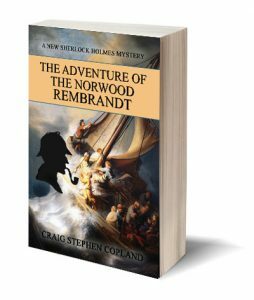 This new Sherlock Holmes mystery is a tribute to The Adventure of the Norwood Builder in the original Canon.